This book helps you to take the mystery out of one of the world's best kept and most profitable career secrets. People across the country are earning a healthy living doing things most of us do every day - eating, shopping, even relaxing. They're known as mystery shoppers, and you can be one of them. What is mystery shopping? It's when companies hire you to assess their products and services. And aside from the wonderful fringe benefits - gratis dining, no-expense vacations, and free car rentals - you get paid for it. Mystery shoppers are used in virtually every city in the United States, by almost every industry, from gas stations to five star hotels to upscale clothing stores. 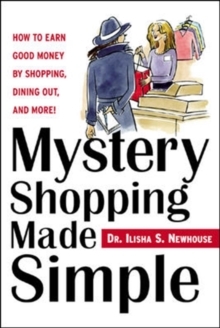 In "Mystery Shopping Made Simple", leading mystery shopping authority Dr. Ilisha Newhouse, shows how to break into this lucrative career, with an approach based on her popular 'How to be a Mystery Shopper' course. You'll learn how to: connect with mystery shopping companies; find the kinds of assignments you want; create shopping presentations and fill out evaluation forms; prepare for KASST, the Certification test offered by the National Center for Professional Mystery Shoppers; and, much more. Whether you're in the market for a full-time career or are looking to supplement your income - or you just want to enjoy the freebies - this book can help you go from a zero investment to thousands of dollars a year and beyond.